When it comes to online cigar shops, consumers have a lot of options (ranked here!). But when it comes to cigar auction sites, there are two options: Cigar Bid and Cigar Auctioneer. Of course, the question then is: which is better? The short answer is that Cigar Auctioneer is currently the better choice by far. Though both websites have great selection and similar shipping rates, Cigar Bid has had serious issues delivering cigars that are properly humidified. Their customer service as well is quite lacking, with many users reporting that after receiving incorrect orders or damaged cigars, the Cigar Bid team was nearly impossible to reach and unresponsive. First, let’s go over the most basic differences. Cigar Auctioneer has three types of auctions: one item/one winner, multiple items/multiple winners, and multiple items/one winner. Cigar Bid has those categories as well, and also has “Quick Buy” and “Freefall.” Freefall lots are displayed with prices decreasing, live—I am actually not sure how much value these provide. Quick Buy lots are discounted packs of cigars that can be purchased for a slightly higher—though still highly discounted—rate on the spot. One advantage I see with Cigar Auctioneer on the features side is the lot history function, which allows you to see the past, present and future lots for a particular brand—perfect if you know exactly what you want and have the patience to wait and be notified. This is a big plus for me. So on this category, the two websites tie. There’s no quick answer here. Both have good selection, though I think Cigar Auctioneer has more mainstream brands than Cigar Bid does. As a fan of Davidoff cigars, I did notice that Cigar Auctioneer has more from that brand, but from what I’ve seen both sites have different product on display at different times. Cigar Auctioneer wins on this category. Prices on Cigar Bid, though good, tend to be a bit higher simply because it seems to be the leader in auctions by volume. It’s pretty simple: if more people are bidding, the bids will go higher, as some have reported. On the other hand, Cigar Auctioneer sets a higher minimum bid price. This is one area where Cigar Bid quite unfortunately falls behind. In the probably half dozen orders I’ve received from Cigar Bid, I’ve often had cigars that were underhumidified or cracked. It’s one thing to get a great deal on cigars and get what you ordered. It’s something else entirely to order cigars for cheap and then find out later they might have been cheap because they were improperly handled! I’ve never had this issue with Cigar Auctioneer. They win the product quality category easily. Cigar Bid and Cigar Auctioneer are fairly close here. Regardless of what website you are using, it is important to get multiple items shipped in the same box to save on shipping costs. I’ve got to say, as much as I like Cigar Auctioneer in terms of quality and selection, I really hate the look and feel of their website. Cigar Bid does a great job of advertising the great deals that they have, and their daily newsletter does a good job of describing new products that go on sale. Cigar Bid wins this category easily. Cigar Bid has had issues selling cigars that they don’t have—where the user wins the auction and is later notified that the cigar isn’t available (this happened to me twice). It’s a frustrating situation, and has been documented by other users. In fact, Cigars International (the parent company for Cigar Bid), has had a truly awful couple of years. With technology issues and customers receiving incorrect orders and then not having the order corrected, they’ve really dug themselves into a hole that they will have a hard time getting out of. Cigar Auctioneer on the other hand has great ratings with users and I can’t find any consistent negative reviews online. At the end of the day, Cigar Auctioneer is the site I recommend to use for cigar auctions. They carry more of the brands that I enjoy, and make it easier for me to track when my favorite brands come on sale. I also know that the quality of the product will be consistently great, and that if I have an issue, I’ll have Famous Smoke Shop‘s customer service there if I have any issues. Only note to the Cigar Auctioneer team: at least make those product photos bigger… please! Ah, the mystical Island of Cuba. For the U.S. it’s the forbidden country that secured the embargo on September 7th 1962 when John Fitzgerald Kennedy re-instated the Trading With The Enemy act of 1917. Since then U.S. citizens have only be able to travel to Cuba for very strict diplomatic or humanitarian reasons and return with no goods from the country… until now. Last year President Obama repealed the travel ban on Cuba creating more broad allowances for U.S. citizens to travel there. Better still the former president lifted restrictions on bringing back goods from Cuba to the United States. For beloved cigar smokers this was fantastic news. Having traveled around the world smoking Cuban cigars, finally being able to visit the country and farms where the famed tobacco is grown is a cigar aficionados dream come true. In this first report I will touch upon the ease of travel to Cuba and the state of cigars I found in Havana. Also included is a list of the best places to purchase cigars and where I found some older vintages lying around. Traveling to Cuba was as easy as booking a flight with Delta straight to Havana. You can pay with your credit card through Delta however you can’t use any U.S. credit cards when you are in Cuba. Cuba is strictly cash for Americans and you can exchange U.S. dollars for Cuba’s CUC’s at the airport or any bank in Havana. Be aware that U.S. dollar incurs a 10% transfer fee when exchanging to CUC’s. You will also need a travel visa along with one of the twelve reasons you are traveling to Cuba. Most visitors will fall under the “People To People Educational Act” so long as you visit a cigar factory, farm, rum distillery or art museum. Touring a cigar farm, a rum distillery or viewing art is a pleasure in Cuba and the culture is what you are looking for. You will need to purchase a travel visa as well as book a hotel in advance. I suggest using a third party travel site which takes care of all those things for you. You can pay in advance which leaves you only having to bring money to spend on your trip. I recommend the Educational Adventures Company as they were excellent in making those arrangements as well as getting you into any factories or farm tours. They will also set you up with a translator and driver if you desire. The prices were very reasonable and their service fantastic. http://www.theeducationaladventurescompany.com/ If you wish to book on your own you need to contact the U.S. Office of Treasury and request a visa for purchase. In booking a hotel you would need to book online. Arriving in Havana I grabbed my taxi and headed to the Casa Particulares I was staying at. The first order of business was to relax on their rooftop have a mojito and view the city as a whole during the early afternoon. Havana is as you see it in pictures; a run down third world country with half built structures, renovated 50’s American classic cars and beautiful French/Spanish architecture from the days when those countries ruled the island. The people are friendly and eager to please in what is now a boom in American tourism. In speaking with the Casa owner he said since Obama repealed travel restrictions they saw a rise in visitors from the U.S. to a million last year and near two million this year. The fear the Cubans have is keeping up with the demand. Before hitting the Casa Del Habanos which are the authorized Cuban cigar dealers and the ONLY place you should be buying cigars, I hit a Paladar which is a restaurant run by the locals and not the government. Stay away from any government run establishments as the food and service are mediocre at best. I had some of the best octopus of my life at a local Paladar and was handed a cigar to smoke with my meal. This was a local farm cigar and the flavors of earth and fresh tobacco where present. It was more of a one dimensional smoke but the earthiness hit the spot with the perfectly cooked slightly smoked octopus. With some hearty fare and a cigar to match it was time to hit the La Casa del Habano. As I said before these are the only official stores that carry authentic Cuban brands. In Havana you will be solicited to buy Cuban cigars on the street for an even cheaper price than the stores. Do not do this unless you want to smoke fakes. If someone tells you their brother’s cousins friend works at the Partagas Factory and gets cigars from there they are lying. At best you’ll get a cigar blended with fresh farm tobacco which will taste nothing like the brands you know. At worst it can be short filler or scraps from a rolling table floor. Don’t waste your money or time on these “faux” sticks. Go to the the La Casa’s and spend your money on an authentic selection of smokes as these will be the best prices you’ve seen as a consumer anywhere in the world. My advice is to flip over boxes and dig deep into their inventory. You may find some boxes with several years of age on them and it is worth the hunt. The proprietors do not mind you rummaging through their stock and will often help you. I was fortunate enough to find boxes with as much as seven years of age on them. They were fully stocked with most brands from 2016 although there were no Cohiba Behikes or Esplendidos to be found at the places I looked. I stayed away from most 2016 vintages as the past crops in Cuba haven’t been great. I did pick up some boxes of ’16 Trinidad Reyes and current Vegueros Tapados which smoked well despite being young and will most certainty benefit from age. I feel the 2016 vintages are hit or miss from what I’ve smoked so be cautious or pick up single sticks to sample yourself. Most La Casa del Habanos carry single sticks although the selections vary. Below is a list of three La Casa del Habanos you should definitely visit. This is where I found the oldest vintages of Cuban cigars and the staff were most helpful. The place to enjoy a custom rolled “Monsdale” cigar which was created by the late Enrique Mons. It’s a thicker lonsdale with a pigtail cap. Flavors of caramel, butterscotch and toast in this unique blend. The largest selection of boxes of cigars in all sizes. If you enjoy the hunt this is the spot for you. Loaded with cigars and satiated from delicious Cuban fare it was time to watch the sunset with a mojito and cigar reflecting on the first day in Havana. In Part Two I travel to the tobacco fields and the famed Robaina Farm. Stay Tuned! How Long Does It Take For A Cigar To Go Out? Short, simple answer: depending on the cigar, between 2 and 6 minutes. 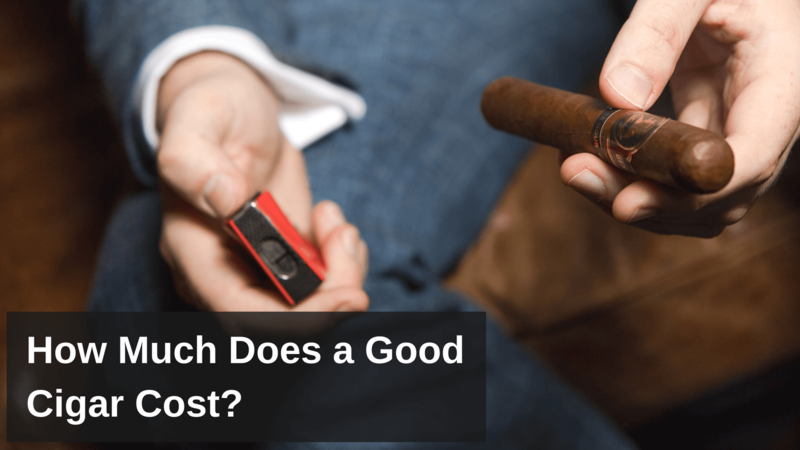 The question of how long a cigar will stay lit is an important one for a few reasons. The first is safety. If you are reading this post to try to determine how long to leave a cigar sitting before throwing it in the trash or outside, here’s the key point: do not throw a cigar away without pouring some water from a glass or the sink over the ember, even if you think the cigar is out. There are too many stories online of those who have died in house fires because they “thought the cigar was out” when they threw it away. Of course, if your cigar has sit in an ash tray for an hour or overnight on the deck, it’s ok to throw away. But don’t play a guessing game between five minutes after you’ve decided to stop smoking your cigar. The second reason this is an important question is for the smoker who wants to pace himself and not smoke through the cigar too quickly. Many new smokers will puff their cigars much too quickly, thinking that their cigar will behave like a cigarette and go out immediately. You don’t need to puff your cigar every 10 seconds. 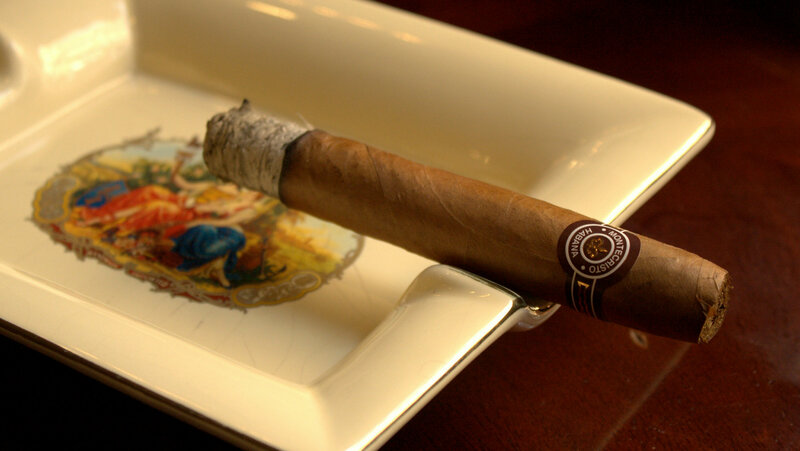 Cigars are a leisure activity, so pace yourself to actually enjoy the smoking experience.